Linda Burton posting from Des Moines, Iowa – “Oh What A Beautiful Morning!” Remember that Rodgers & Hammerstein tune from Oklahoma? Driving through the Iowa countryside a few days ago, with early summer cornfields rolling across the hills to my right and to my left, I thought of a line from that song “….the corn is as high as an elephants eye….” Then I laughed, because the corn I saw was just beginning to get a grip on growing; it’s pretty darned early in the season here. “That corn is only knee high,” I thought. Later I learned that’s the catch-phrase of corn farmers: “We look for the corn to be knee high by the 4th of July,” I was told. That’s the assurance that everything is on track; “elephant’s eye” corn isn’t expected until late September; most harvesting happens in October and sometimes into November. 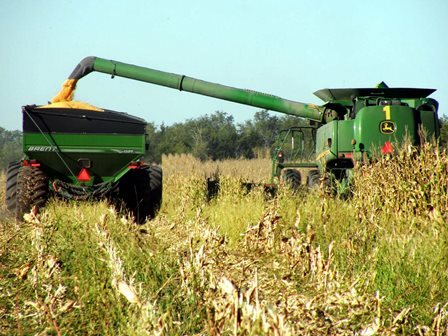 Then there’s a lot of harvesting going on; in 2012 Iowa corn farmers grew almost 1.88 billion bushels of corn, on 13.7 million acres of land; 2013 projections indicate 2.45 billion bushels on 13.97 million acres. 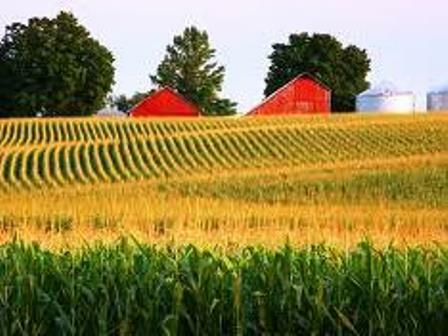 Iowa has produced the largest corn crop of any state for more than two decades; in an average year, Iowa produces more corn than most countries! And it’s been the dominant crop in Iowa for more than 150 years. The reasons are simple – a growing season that is long enough and warm enough, ample rain, and deep, rich soil. Iowa also produces livestock whose waste includes nutrients that are key to fertilizing the fields for better corn production. According to Iowa Agriculture farm statistics, in 2012 there were 195,000 sheep and lambs on hand, 3.9 million cattle and calves, and 20 million hogs. And, by the way, Iowa is the number one pork producing state in the country too. I went to the Iowa Agriculture website for some basic farm facts; I wanted to know how many farms there are in Iowa, overall. The answer (as of 2011) is 92,300 farms, covering 30.7 million acres of the state. The size of an average farm is 333 acres, valued at about $6,708 per acre. That long growing season I mentioned has temperatures ranging from an average of 13.2F in January to 75.3F in July, with an average annual rainfall of 45.10 inches. Soybeans, milk, and eggs are other biggies in the state; 466 million bushels of soybeans grown on 9.23 million acres in 2011; 4.33 billion pounds of milk produced; 14.5 billion eggs. Equate that to how many glasses of milk you drink in a week, or how many sunny-side-up breakfasts you enjoy. As to the bacon that accompanies those breakfast eggs – I pulled some numbers from the National Pork Board and the US Census of Agriculture. Iowa has about 8,300 hog operations; more than 39,000 jobs are directly related to raising and caring for hogs in Iowa; the industry generates nearly $950 million in household income for pork producers. 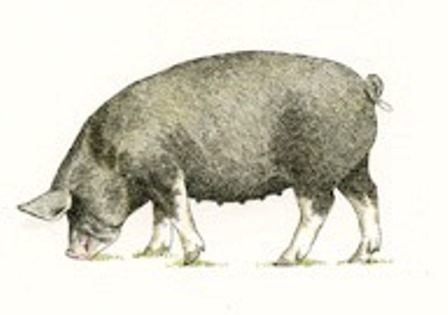 Enough with the numbers; I wanted to know what kind of hogs are raised, and what is different about each breed. But first a little Pig Latin Lesson: “boars” are males of breeding age; “sows” are breeding females; and “piglets” need no explanation; they are the unweaned little ones. 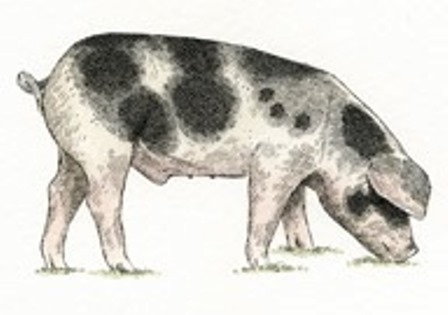 From the Des Moines National Pork Board website, which also has delicious recipes for the use of pork, I learned that most hogs bred for consumption are the offspring of a combination of breeds – usually dark-breed boars bred to white-breed sows. 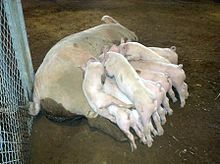 Dark breed boars enhance meat quality; white-breed sows produce many piglets, plus their maternal instincts allow more piglets to survive. A producer will choose a particular breed, or combination of genetic lines, based on what they are looking for with regard to meat quality, farming method, and the hog market. Here are eight of the most widely popular. Berkshire. 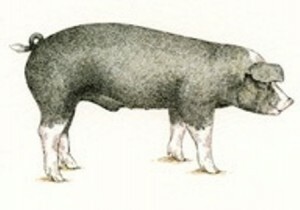 A black pig that originated in Britain in the mid-1500s, prized for juiciness, flavor, and tenderness, yielding a pink-hued, heavily marbled meat suitable for long cooking times. Chester White. Used in commercial crossbreeding; originated in Pennsylvania in the early 1800s when white pigs common to the northeast US were bred with a white boar imported from Bedfordshire, England. 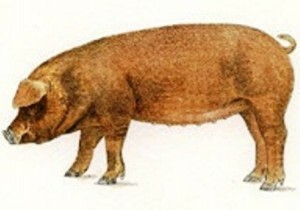 Duroc. Known for quick growth; red or black coloring; the second most recorded breed in the US; a main sire choice of American farmers. Sweet meat, amazing shoulders and spareribs. Hampshire. Fourth most recorded breed in America and oldest American breed in existence; stock imported from Wessex, England in 1832. Black with a white belt across the shoulders, a lean-meat breed. Landrace. 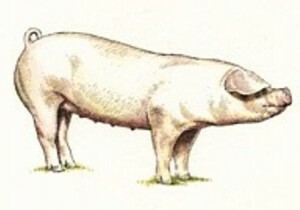 Fifth most recorded breed in the US; known for large litters of piglets. 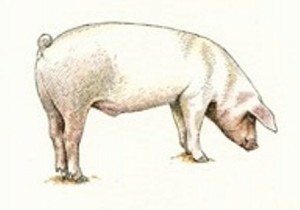 A white pig, descended from the Danish Landrace; produces a large and flavorful ham and loin. Poland China. 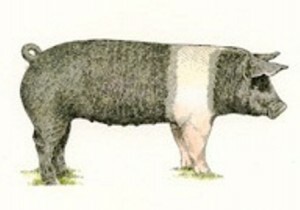 Black with white face and feet, derives from many breeds, including the Berkshire and the Hampshire. Known for large size; one of the most common breeds in the US. Spotted Pig. Black and white spots, no red or brown; popular in the US because of high meat quality and ability to gain weight quickly. Yorkshire. #1 recorded breed in the US; white, very durable and muscular, high proportion of lean meat. Developed in the county of York, England, and brought to the US around 1830. Now that you’re up on pigs, let’s get back to corn. Because, you see, most Iowa corn goes into animal feed. 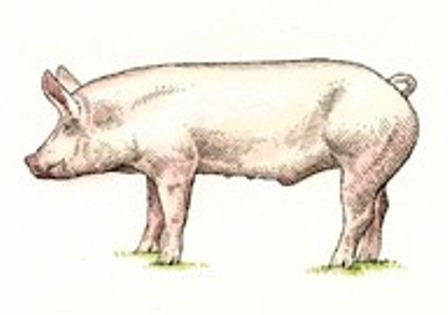 One bushel of corn converts to about 13 pounds of retail pork. 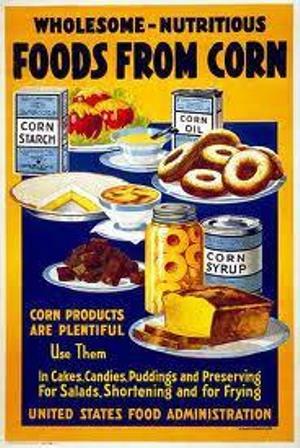 Iowa’s corn is also processed into starches, oil, sweeteners, and ethanol. Most of the corn you see growing in fields across Iowa is field corn, not the sweet corn-on-the-cob you think about for summer cookouts, dripping with butter. The sweet corn that is grown in Iowa is usually sold at farmers’ markets and roadside stands, not shipped out of state, so if you live in Arizona or Vermont, you’ll likely never see Iowa corn in your supermarket. But it will be in products you use – the Corn Refiners Association has conducted surveys tallying all supermarket products that contain corn ingredients and come up with the staggering number of at least 4,000. Read your labels! Corn is nearly everywhere – even used in paper products. 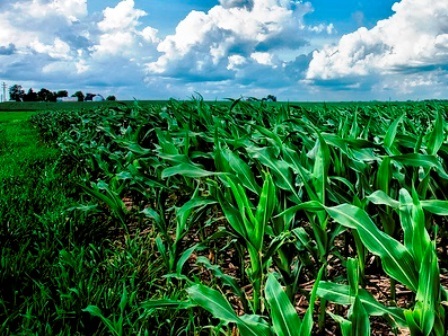 And corn grows nearly everywhere; you’ll find it on every continent except Antarctica. It is descended from a plant called teosinte, which still grows in Mexico; the first corn plants seem to have appeared in Mexico. Millenniums of breeding, first by Native Americans, then by early pilgrims and modern scientists, have resulted in larger, fuller ears, and made corn one of the world’s three leading grain crops (rice and wheat are the others). 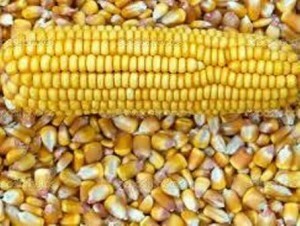 Much of Iowa’s field corn is bred to develop just one large ear rather than several incomplete ears; the number of kernels per ear vary from 500 to 1,200, but a typical ear has about 800 kernels. 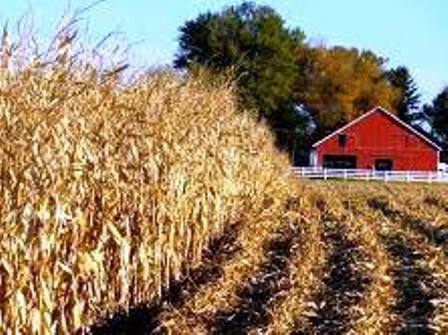 A bushel of shelled corn (after husks and cobs are removed) weighs about 56 pounds and last year Iowa corn growers harvested an average of 172 bushels per acre of land (the national average was 147). To further visualize, an acre is about the size of a standard football field. About those husks and cobs – when corn is harvested the combine strips the husks off each ear and removes the kernels; the kernels are stored in a holding tank until they can be unloaded into a truck. But the husks and cobs are spread back into the field as the combine moves along; it’s just like mulch in your home garden. Good soil fertility is there for the next crop; corn plants that will grow up to 12 feet tall, just about as high, I’m thinking, as an elephant’s eye.